"Excellent. A fine example of what popular philosophy can be: wide-ranging and thought-provoking, in little more than 100 pages. 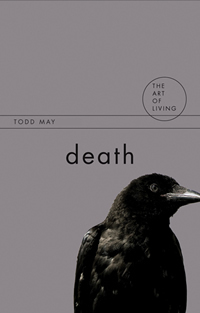 May grasps the real paradox of mortality: that the fact of death imbues our life with passion and urgency, but it is that very passion for life that makes death tragic." "Death exemplifies how popular philosophy should be done. It is a thoughtful, engaging, and carefully written reflection on the nature of death and what our response to it, as mortals who are aware that we will die, should be. Moreover, although it is aimed at a general audience Death is also likely to be of interest to philosophers who are professionally engaged with the questions that it addresses. May's philosophical range is broad, and so this book could profitably be used as an introduction to Ancient, Anglo-American, Continental, and Eastern views on death for persons unfamiliar with one or more of these traditions." Each of us will die. Sooner or later, each of you reading this words, as well as I who write them, will be dead. This fact about us affects our lives perhaps more profoundly than any other fact about us. We live inescapably in the shadow cast by our mortality. Almost everything we do is, in one way or another, structured by our knowledge that some day we will no longer be here. This does not mean, of course, that we bring the thought of our death into every activity. It is not as though as I'm fixing my breakfast I must think to myself that I must eat such-and-such or do it in this or that way because I'm going to die. The influence of death is usually more subtle (although at those times when our mortality confronts us with some imminence the subtlety quickly drains away). We might put the point by saying that we live as mortal beings, as beings who know they will not always be alive. Our projects, our relationships, our thought about the trajectory our lives have taken or might take: all of these are in thrall to the knowledge that our participation in them will end with the end of our lives. Of course death is not simply a fact to be registered like other facts about us. It is not like our height or our hair color. For most of us it is the source-or at least one of the sources-of our deepest dread. The shadow it casts over our existence is like a reminder that whatever we do, however we feel, there will come a time when we cannot do and cannot feel. Moreover, our death, while inevitable, is also uncertain. We can die at any moment, which lends to every moment a sense of precariousness. We may not reflect upon this precariousness, but we live it. Often we live it in the way of denying it or warding it off. We pretend it's not so. But this pretense is already a way of recognizing it. All of this may make it seem that immortality would be better than mortality. To live forever might appear, at first blush, to solve the problems our death creates, to dissolve the shadow it casts. This would be true, but it should not console us. Immortality would bring its own difficulties, difficulties as weighty as those of our mortality. Imagine doing something you love to do: talking with friends, making love, writing poetry, playing sports. Now imagine doing it for a thousand years. Now imagine ten thousand. And now recognize that those ten thousand years would not even be the blink of an eye in the stretch of immortality. If we were immortal, how would our lives go? They would become shapeless, without form. Every moment would be less urgent because there are so many of them, an infinite number to be exact. When life loses its precariousness, it also loses its urgency. Sooner or later, the days would stretch out endlessly, our having done everything we might do over and over again until all of its angles were thoroughly, and more than thoroughly, exhausted. Death is bad. Immortality would be bad as well; it is not even something we should wish for. This is the dilemma of human living. It is a particularly human dilemma because of our reflective recognition of our deaths, which give it a particularly important place in structuring our lives (although it is entirely possible that other animals, for example the great apes, also live with something like this recognition). The question confronting us is one of how to live within the framework of this dilemma. How to go on realizing the inescapable although uncertain end of our existence, and without the image or fantasy of endless existence? We must balance at least two attitudes toward time, the time of our lives. On the one hand, we must learn to live in the moment. After all, none of us knows how many more moments we will have. On the other hand, we cannot be entirely absorbed by the moment, because we are creatures of our projects. We live toward the future, in our relationships and in our commitments. To abandon these would be to abandon what makes each of us who we are. So we must live in the moment and for the future at the same time. Both of these attitudes toward life are given their meaning by our mortality. Death is that paradoxical phenomenon that at once threatens the meaning of our lives and yet helps grant the meaning that they have. Death may cast its shadow over us, but that shadow may, if we see it aright, contain its own strange but undeniable glow. Todd May is Class of 1941 Memorial Professor of the Humanities at Clemson University, South Carolina.